UDM Downloads > Microsoft Outlook Conversion! 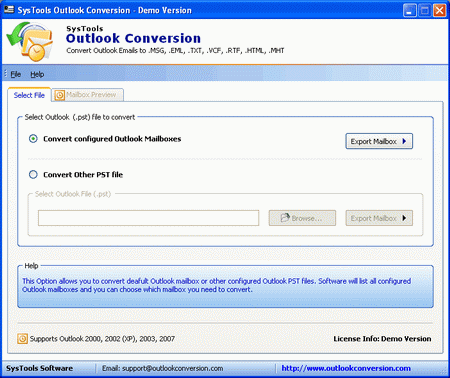 To convert Microsoft Outlook PST files into other formats you can use Microsoft Outlook Conversion Tool. This tool provides a way to convert Microsoft Outlook PST files to EML, vCard, TXT, RTF, HTML, MHT and MSG files. Well there are many reasons to do so. PST to MSG conversion is beneficial in forensic mail archiving of Outlook mail messages. PST to HTML helps you in reading & saving Outlook emails in HTML pages. PST to vCard is beneficial in importing the contacts to other email clients that accept VCF format & to other devices like Palm, mobiles etc that accept vCards. There are many more benefits of doing Outlook Conversion to other format. When a user decides upon to do MS Outlook Mailbox Conversion, then the next step towards PST Conversion is to choose a Microsoft Outlook Conversion tool. Microsoft Outlook Conversion Tool is easy to use & easy to navigate. Convert Outlook Emails of all email folder structure (Inbox, Sent Items, Drafts, and Deleted Items & Outbox) along with all email properties (to, cc, bcc, attachments, sent/received date & time). Grab the demo version of Outlook Conversion tool for free & get acquainted with the working of the software, for the trial version of Microsoft Outlook Conversion tool migrate 15 emails. After download the Demo version of SysTools Outlook Conversion Software, you can start this by clicking Start and pointing to Programs. Then, on the Programs menu, click the link SysTools Outlook Conversion. And then if your satisfaction allows for, purchase the Microsoft Outlook Conversion program at $49.